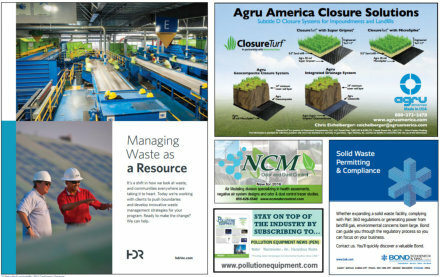 Advertising is an excellent means for your company to display its unique services to solid waste and recycling professionals through print and electronic media. Act early to draw attention and maximize your investment! The printed Conference Program is a FULL COLOR, 8-1/2” x 11” booklet. It includes the technical program, attendee registration form, hotel information and early sign up of exhibitors and sponsors. It is mailed in late January and has a widespread distribution of approximately 7,000. An additional 1,000 are made available through environmental trade groups and state agencies for mass distribution. It is also electronically available on the conference website for three (3) months prior to the event. The printed Welcome Program is a BLACK & WHITE, 8-1/2” x 11” stapled book. It includes the final technical program, trade show floor plan, acknowledges all the generous sponsors and Products & Services (company name, booth #, website and description). It is distributed on site to approximately 700. Resource Marketplace is part of the year round Conference Website (nyfederation.org). The company name, description and hotlink are listed. Searches can be done by category and alphabetically. The website receives 45,000 hits annually and Resource Marketplace receives 7,000 hits annually. An Excel Attendee Database is provided two weeks prior to the conference.